Facebook reviews are now Facebook recommendations. The change was announced in August of 2018 with existing reviews being preserved. 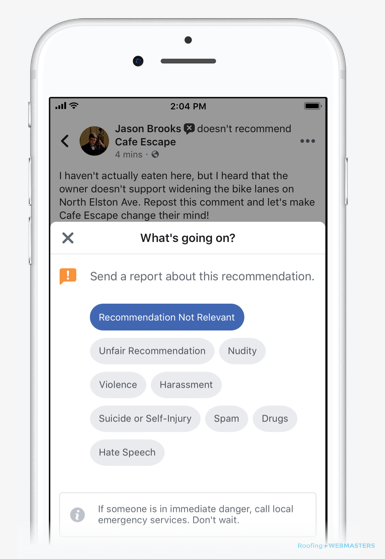 The concept of Facebook recommendations is to differentiate the platform’s consumer feedback section from that of Google and Yelp in particular. The 5 star scale is no longer used when “recommending” a company on Facebook. Customers will still have an opportunity to explain their recommendation by writing feedback for the public to view and consider when making their own purchase decisions. This is employed using Facebook’s review tags system. What Changes for Roofing Businesses? The 5 star rating is no longer an aggregate of individual reviews but rather a ratio of of how many customers recommend the business. 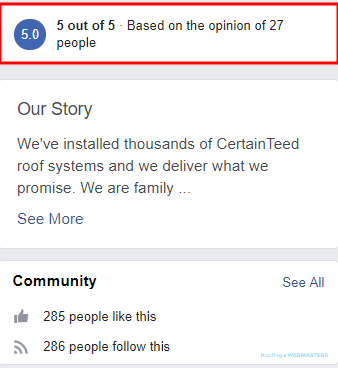 Friends of Facebook users who have recommended your roofing company will now see you first when searching for a local roofer (if applicable). This is Facebook’s way of increasing the trust equity attached to customer feedback on their social network. Despite this new quirk, the majority of your Facebook marketing strategy will remain unchanged. Whether they call them recommendations or reviews, customer feedback is valuable for roofing companies. This is especially true on such a highly populated social network like Facebook. Aside from Google reviews, Facebook’s recommendations are considered among the most influential on the internet along with Yelp. When you consider how often people visit their Facebook page (approximately 8 times per day), it is fairly evident as to why that is the case. Google also holds Facebook signals in high esteem which can impact the authority of your business on search engine results. Every time a verified Facebook user is talking about your roofing company, it builds more authority. As you may have known, Google’s search algorithm is big on authority and for good reason. When locals search for a roofer they want to find the one that people are talking about and one that is trusted. Perception is reality for many roofers throughout the United States. Before a customer can choose your services they must first be aware of their existence. Feedback puts your business in front of more eyes including its logo and contact information. Reviews help build brands and generate leads. There is no more valuable content than that which is user generated. Roofing Webmasters provides the Righteous Reviews widget on all client websites which pulls feedback from Facebook and Google to populate the homepage for roofing companies. Google takes notice to when ranking sites. Users are prompted to recommend a company with a yes or no response. Sometimes the answer will be no and in cases like these, the option to leave expanded feedback remains. To put it simply, distressed customers will still have a platform to eviscerate your business to the public. They might embellish the worst mistakes of your service and even personally attack you or your employees. You will reserve the right to respond to these complaints which you should do in a professional and constructive manner. If a negative recommendation is 100% untruthful, irrelevant, or consists of hateful speech, you can petition Facebook to have it removed. Updated on March 11, 2019 at 6:48 pm by Roofing Webmasters.